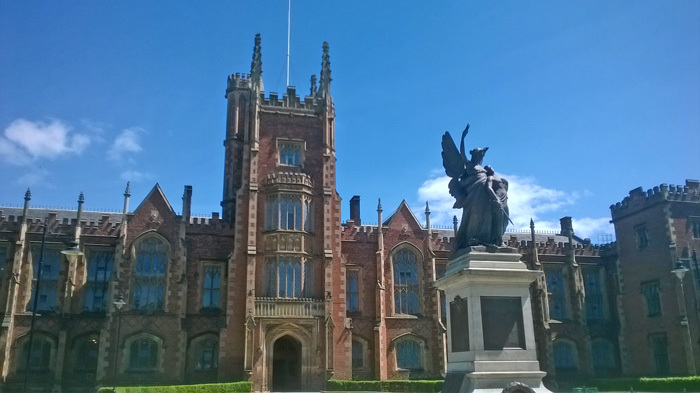 Queen�s University (informally Queen's or QUB) is situated at University Road, Belfast. Queen's is a public research university which was chartered in 1845, and opened in 1849 as "Queen's College, Belfast". Throughout the two wars it was the main university in the north of Ireland. It had an Officers' Training Corps. Queens also has a Book of Remembrance. 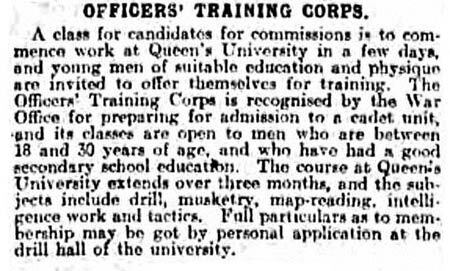 A class of candidates for commissions is to commence work at Queen�s University in a few days., and young men of suitable education and physique are invited to offer themselves for training, The Officers� Training Corps is recognised by the War Office for preparing for admission to a cadet unit, and its classes are open to men who are between 18 and 30 years of age, and have a good secondary school education. The course at Queen�s University extends over three months, and the subjects include drill, musketry, map-reading, intelligence work and tactics. Full particulars as to membership may be got by personal application at the drill hall of the university. The Queen's War Memorial, which was erected in memory of those members of the University and its OTC who died in World War One, was first dedicated on 21 July 1924 by the Duke of York (who later became King George VI) accompanied by the Duchess of York. The Memorial was designed by Sir Thomas Brock. However, he died before he could finish the work and the Memorial was completed by Mr F Arnold Wright. It is a depiction in bronze of a winged Victory sustaining a fallen youth. All of the names of those who died in conflict during this War are recorded on bronze tablets on the Memorial. In 1947 it was decided that the names of those members of the University who had died in conflict during World War Two should also be inscribed on bronze tablets to be placed on the plinth of the War Memorial. The re-dedication of the War Memorial took place on 8 November 1950 in the presence of Field-Marshal Viscount Alanbrook, Chancellor of the University.